Fully weather-proof 5mm thick PVC material. Each plate is supplied with screws and rawlplugs. Make it easy to find your driveway entrance, especially on dark, rainy nights. 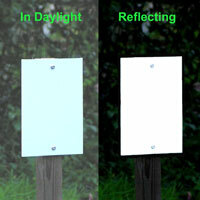 If your neighbours have reflecting markers, choose unusual colours to make yours stand out from the rest. Supplied pre-drilled, ready to fix with screws provided. NB: Now supplied with 4 screws and corner holes.